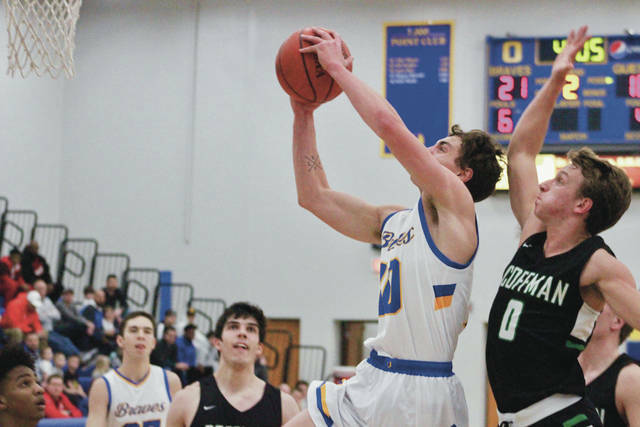 Olentangy’s Alex Sieve soars to the hoop in front of Dublin Coffman’s Evan James (0) during the first half of Tuesday’s non-league showdown in Lewis Center. LEWIS CENTER – Senior Sean Marks scored 15 of his game-high 20 points in the second half, but his game-tying 3-pointer at the buzzer fell short and Olentangy was downed 64-61 to third-ranked Dublin Coffman Tuesday night. Marks made a spectacular basket – flipping it in while being fouled after a spin on a drive on the right. He knocked down the free throw to give Olentangy a 61-59 lead. But Keaton Turner hit a step-back 3-pointer from the top of the key to put Coffman back in front. Turner scored eight of his 17 points in the fourth quarter to lead the Shamrocks. Then, Marks drove left and spun, but his shot fell short and Turner knocked down both free throws on the other end after a foul. Tavian James got the ball at the top of the key and handed to Marks, who got a contested shot off that hit the front rim at the buzzer. James, Alex Sieve and Austin Brown had seven rebounds apiece and Luke Riedel had four assists to lead Olentangy (8-7). Brown finished with 10 points and Caleb Steele added nine to back Marks. Steele and Riedel each converted and-one plays and Marks added a 3-pointer to help Olentangy start 15-4 with a little over 3 minutes left in the first. Coffman countered with a 17-6 run and took its first lead on an Evan James basket with 3:15 left in the half. Sieve gave Olentangy the lead back on its next possession on a put-back. Olentangy led 27-26 at the break. Will Hunter converted a 3-point play to start an 8-0 run, which was capped by a Turner 3-pointer to give Coffman a 44-36 lead with 1:00 left in the third. Marks got Olentangy within 46-43 in the final seconds of the quarter when he was fouled making a 3 and added the free throw. Steele opened the fourth with back-to-back baskets to give Olentangy the lead and it stayed close to the end. Dominque Penn had 16 points, Luke Bartemes added 12 points and nine rebounds, Grant Yeater chipped in nine points and five boards and James pulled down seven rebounds to back Turner’s effort for the Rocks (16-0). Next up, Olentangy travels to Westerville Central Friday night in OCC-Buckeye play.